It's winter, depending on where you live it may be colder than normal. The conditions may be icy, wet and different than your used to running on. 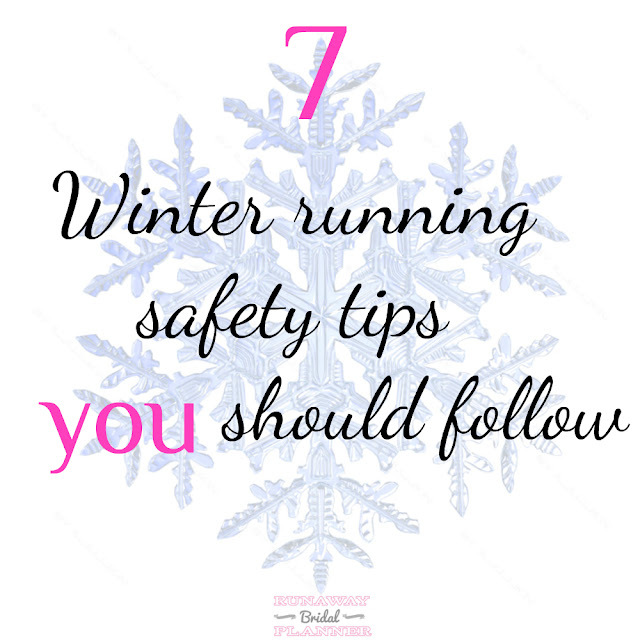 So today, I wanted to share some winter running safety tips that I use. 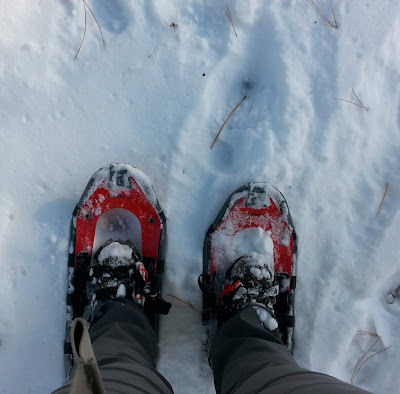 Sidewalks may be covered in snow and ice, and may not be able to be traveled on safely, which forces more runners to have to run on the road itself. If you find yourself running on a road, you should always make sure you are running against traffic. So you can see what is coming at you, in case you need to move quickly to get out of the way. A lot of people think darker colors in the winter are better because they help you stand out a little against the snow, that isn't exactly true. Winter drivers are a little snow blind, and sometimes can't see the person in black. But brighter and yes I am talking some neon's (I know the shame, LOL) can actually be far more beneficial to you to be seen by a driver than darker colors. Let's face it, night running is dangerous any time of year. But in the winter it is even more dangerous especially if the roads are icy. Drivers are putting all their concentration on the roads to be safe, they may not notice you as they may normally in better conditions. So if you have to run at night, invest in vests with lights, or reflective gear and avoid the streets and stick to the sidewalks and pay attention at all road crossings. Or even better, head to a local track. If you are running on the street, or if you are going to be coming to intersections and will be crossing them. You need to be more focused. Why? Well, winter drivers are the most unsafe drivers out there. Not only because they refuse to hang up on their cell phones. But there attention is focused on avoiding sliding off roads or the other road conditions. Your the one that needs to be the most alert. You should assume ever driver can't see you, and isn't paying attention. If you are lost in thought in your music, you could miss stopping or getting out of the way from a distracted driver who has their concentration elsewhere. Instead save the music for area's that require less of your attention. Why is this a category? Well I will tell you. Many runners training in the winter are going to be running early spring road races. If you spend the entire winter indoors, your muscles will weaken, you'll be less conditioned from the softer surfaces and more accident prone when you get out onto a harder surface. Especially if you don't ease or gradually get back into the harder surfaces. 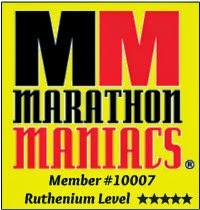 So if you want to safely train through the winter and you have spring races coming up. You should definitely be running outdoors at least once or twice each week to keep your body properly conditioned. You've probably seen the ID tags, you can put them on your shoe. A necklace or bracelet. No matter which you get, you should have one on you. It should have your name, your address, an emergency contact number or two. Any allergies or serious medical conditions you have. Some also put their blood type on it. You may find this tip strange, and may be wondering why I am suggesting it on winter running safety. It's true, this is a year round tip. But winter is a different time, you find someone new on the road or trail, you're colder your mind isn't quite as quick to think and sharp. Things start to slip and before you know it, you may have just told a stranger too much about yourself. That you run on that trail/road all the time alone, that you run in the area every Monday etc... Passing out too much information even to a stranger that seems friendly enough can be extremely risky. If you don't know them, don't give them any personal information, and definitely do not share your running schedule with them. Additionally, getting in conversation with the wrong person and you could find yourself having a hard time getting away from someone that later you find makes you uncomfortable. I share this, because I made this mistake earlier this year, and let me tell ya it was a very uncomfortable situation. Those are a few of my tips, what are some of yours? The most difficult balance I find in winter is running outside, but not running in the dark. Now that it's getting staying lighter longer, I feel more comfortable about my weekday runs, but not when we first fell back an hour. It was finally perfect weather to run outside, but it got dark so early after I got home from work. I'm weird about "stranger danger" too. I don't tell people where I live until I know them very well. Better safe than sorry! me & my hubs have that argument every time about traffic. He doesnt believe me on this so every time I see it, I let him know he needs to read it ONCE AGAIN. I went out the other night & the sun set quick on me & I was in all black... I was a nervous wreck getting home. Wearing bright colors and running during daylight cannot be stressed enough. During the daylight, not only will drivers be able to better see you, but you'll also be able to better see the ice. Nobody wants to slip, fall, and injure themselves, and if you can't see the ice then how will you avoid it?!? Good points! I do most of these but I didn't even think about the not talking too much to strangers thing. This is a great list. My favorite safety tip is to mix up your routes so that your habits aren't obvious. Excellent points. I wore my neon yellow tights just this very early morning so I would glow in the dark! A minion would probably be the best reference. LOL. These are fantastic tips! I'm definitely guilty at times of hibernating in the winter, and I don't do a very good job at all of wearing ID when I workout outdoors. It sounds like you had a pretty awful experience with #7 - I truly never think about that, but you are SO right! Nice tips. The roads near my house are not the safest to run on! I live in the country on back roads but my road is pretty busy, lots of big trucks FLY down it because they "can" on the back roads. I also get SO creeped out if I run too late and it starts getting dark haha I'm such a baby! Great tips!I don't talk to strangers when I am running....I watch too much ID channel -lol! There are crazies out there!!! I would add dressing in layers. Running against traffic is so important and yet I see so many runners out there being so unsafe. I would add run with a group! Safety in numbers right! I agree, running in the dark can be so dangerous! I am loving that each week right now it's just getting lighter and lighter. I was noticing last night we've already gained an hour more light since Christmas! So smart, I am the same way! Although I made a mistake last summer and let some girl follow me home, dumb dumb mistake it's why it made the list! My sister is the same way, she has this ridiculous idea that cars should just move and get out of her way even if she can't see them. Drives me crazy! I see so many runners all in black in the winters, half the time I don't notice them until I"ve about passed them. I think they think dark stands out, but it really doesn't. The stranger thing, I made the mistake once last summer and it will never happen again. Oh that is a great tip and I totally agree with it!!! Oh ya, running in the dark, or on unsafe roads.. 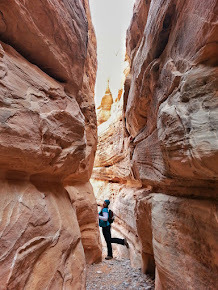 It a tough job for a runner to keep safe places that is for sure! LOL, usually I totally hate talking to people while running, unless I know them well. But last summer I had this girl come up and ask if she could run with me, she looked harmless and probably was, but instead of just running with me she wanted me to take my headphones out and chat the entire time. When I told her I was cutting my run short and heading home, she followed me to my house. Granted she was harmless, but seriously that could have gone wrong in so many ways, so now I am so cautious! Oh yes, dressing in layers is a must!!! Definitely safety in numbers, especially if you have a group! If not, I guess just street smarts right! I am very guilty of NOT wearing ID when I run, which I know is not smart but continue to do it anyway....I am def going to follow some of these great tips! Great tips, some that can be utilized year-round. Funny how common sense you'd think these things would be, but even experienced runner forgot some of the most obvious advice. ID is SO important to wear on your run. I always wear my Road ID, in fact, I never take it off. And, I used to listen to my iPod when I ran, but since running with a group, I never listen to music anymore. It's become such a rare thing for me to do. I only do it if I'm working out in the gym. Great tips! I don't really have any winter running tips as this is actually the first winter I've run outside through the months. Although I have been splitting my miles between outside and inside and I run during the day so I avoid having to run in the dark. So I guess one tip I may have is try running during your lunch hour if possible. It will allow you to run during daylight hours so you can avoid some of the dangers you mentioned! All great tips! Running against traffic! Yes! I'm shocked every time I see someone running the wrong direction!! I saw a mom pushing a triple stroller on the street and she was running with traffic. I wanted to stop her! Do you wear a running watch when you run? I run with my watch all the time, so it made sense to have my id on my watch. I think these tips could be applied all year round. But most importantly always tell someone where you are going and how long you will be. I tell my partner, where i'm going, and roughly how long I'll be. For example, it was the track, which is only 500m from my house (i know I'm lucky). My workout was only 45 mins, but I told him I'd be back within the hour. I always give a little bit of extra time of what I expect. If I'm longer than what I state, then he knows to come look for me.